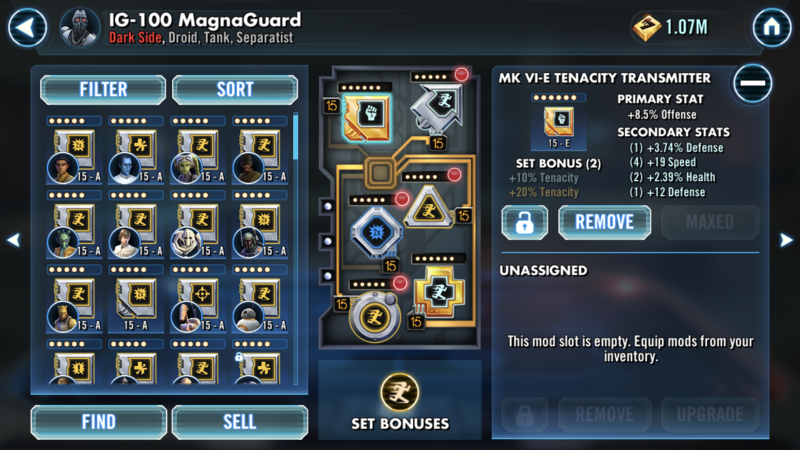 Does bring a mod to 6 dot not increase all stats slightly? I brought a +19 speed mod to 6 dots and it stayed at +19 speed. It increase the primary stat and all the secondary stats of the mod. Not in my experience. Bringing a mod to 6 dot increases the primary stat and slightly increases all secondaries. This. It increases all stats. But this time it did not increase speed at all. Is there a reason for that? But that is not how it worked for me. It was +19 speed before the slice, and +19 speed after the slice. 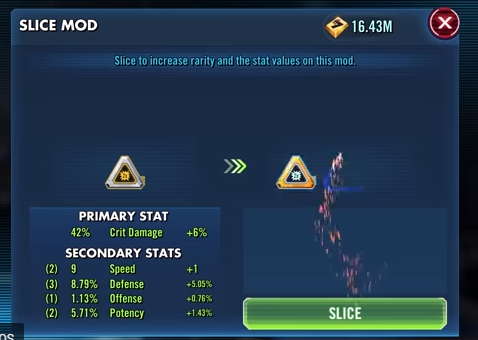 with 19 speed secondary 5* mod you should get a +20 speed after slicing. if you still have 19, contact ea/cg. i had another case last year, when i got a full gear 12 piece as a sith-raid reward. but: it wasn‘t the piece, that was shown in the reward-box. i only knew it could help my pilot biggs. later it was gone. with the help of cg-carrie we found out, that the reward changed. so i believe 100% what you wrote, but please contact support, because tomorrow another player can have this problem. i hope, the technic-profis can find the problem. would be nice if you can report in this threat, how the story ends. normally they are interested to solve such problems fast. Will do. I will let you know how it goes. I have spent the past 20 minutes on the site trying to submit a bug report and it will not let me. The button is there, but pressing it does not do anything. i made a post in reddit and had luck, carrie answered and helped me. If you're on your phone it will get stuck in "preview mode"
In the big text box just above that I usually just type "N/A" or anything really and then the submit button shows up next to preview. I just did the report on my PC and it worked just fine. Apparently the bug reports for a mobile game are not optimized for mobile use. Very intelligent design. Glad it worked for ya. Took me a while to figure it out on my phone the first time. A real pain. Obvious bug. Submit a report.